The Revenant (2015) is the perfect encapsulation of Leonardo DiCaprio’s talents as an actor, both good and bad. There is no denying that he is one of the most committed actors of his generation, fully willing to jump into a role and do whatever necessary to pull the performance off. But that overwhelming enthusiasm also works as a detriment. Sometimes he goes so hard, so intense, that it turns against him. He wants us to see how determined he is by going through an emotional rollercoaster, or putting himself in a physical blender to prove how much effort he’s putting in. This isn’t to say he’s not a convincing actor, because he most certainly is. But where others rely on subtlety and nuance to convey feeling, DiCaprio opts to take the much flashier route. For example, the hardship and physical toll his character goes through in The Revenant is so over the top that it’s a miracle that he makes it out of the first act. There’s a masochistic quality in how DiCaprio’s character is put near death again and again. If you like seeing good ol’ Leo getting severely beaten up, this is your movie. 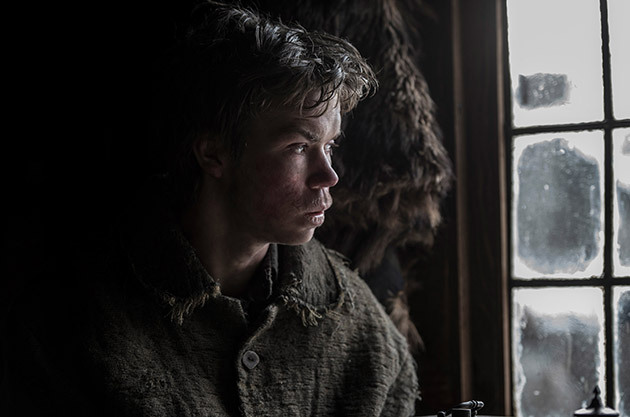 We have him nearly freezing to death in frigid snow, nearly dying of starvation, having his body broken to the point of paralysis, being shot at, eating raw meat, falling from deathly heights, being partially buried alive, and oh yeah, let’s not forget: he also gets brutally mauled by a grizzly bear. I’m not sure how director Alejandro González Iñárritu and his team accomplished this scene, because it looks extremely realistic. We clearly see DiCaprio’s body succumb to the bear’s teeth and claws. But it all plays a part of his career up to this point – his willingness to push past the limit for the sake of his art. We can tell how hard he’s trying. The majority of the plot has him literally crawling through the dirt and mud. But does his ability to go there help or hurt? The screenplay (by Iñárritu and Mark L. Smith, based on Michael Punke’s novel) establishes many themes that appear to get lost within the bloody viscera. The time is the early 1800s. Hugh Glass (DiCaprio) leads a group of American hunters through the wilderness with his half-Native son Hawk (Forrest Goodluck). After an attack by a warring tribe, the hunting party is dwindled to a few remaining survivors. When the bear attack leaves Glass on a stretcher, the group debates whether it would be better to carry him back to civilization or to put him out of his misery. The main proponent of the latter is Fitzgerald (the always fantastic Tom Hardy), a hard and bitter man whose main concern is himself. There are a lot of motifs to piece through here: the invasion of the white man onto native soil, ideas of revenge versus compassion, family, loss, survival, redemption – but all of it is lightly touched upon. These subjects are laid out but not fully explored to their potential. Instead, they get buried under the weight of Glass’ physical torment. I came away thinking more about the horrors he went through rather than what they meant to him as a character. I won’t go into specifics of the plot, but at a certain point Glass becomes transfixed on a particular goal. This is bred through hate and anger and a need for revenge. Combined with the already harsh conditions of the environment, we have a very bleak outlook that provides few moments of respite. I sense this oppressive feeling is due to Iñárritu’s influence as a storyteller. His last picture Birdman or (The Unexpected Virtue of Ignorance) (2014) was a joy to watch – it popped with life and energy. This is more comparable with his work prior to that, like Amores Perros (2000), 21 Grams (2003), Babel (2006), or Biutiful (2010). 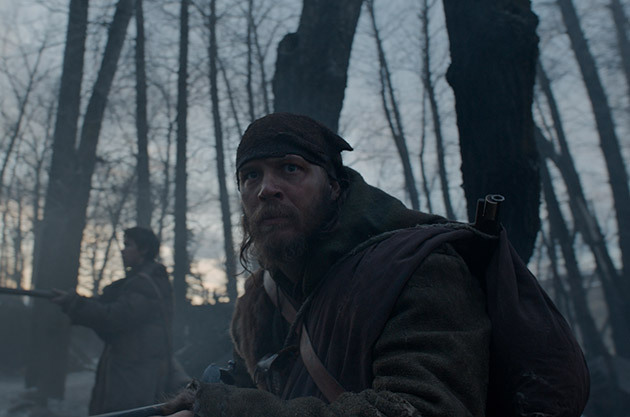 These are unrelenting looks into the darker side of human nature, and The Revenant drops right into that group. But while those films had something interesting to say about humanity in the midst of gloom, everything there is to say here remains at a surface level. Emmanuel Lubezki’s cinematography captures the landscapes with awe. The most impressive shots were the wide angle ones, where characters are surrounded against the massive and dangerous terrain. The shot that stuck with me was where the camera was placed so far back that Glass looked like a speck against a white canvas, with the frame slowly moving in to amplify the difference between the two. The less impressive sequences occurred when the camera moves in for a close up, which unfortunately happens a lot. Iñárritu and Lubezki often have the camera placed too close to the actors. Obviously this was to create a sense of intimacy. But when the lens fog up because of the actor’s breath, it makes the camera’s presence known, taking us out of the story. This happened so much that it became distracting. I’m not going to say that The Revenant is a bad movie, but it’s not a very good one either. Besides the technical flourishes everything else sort of withers away. It’s beautiful, but it’s a beautiful drag. There’s no pathos here, no emotional pull towards the main character’s journey. For as much physical labor DiCaprio inserts into his performance, all we get is someone’s body torn apart for a dull two and a half hours. DiCaprio huffs and wheezes all along his not-so-merry way. For those interested, I would suggest watching the Liam Neeson-starring The Grey (2011) instead. That is a much better exploration of a character going through similar circumstances, and does a more effective job at understanding their motivation to stay alive.